To nobody’s surprise, the Republican Party has held Attorney General Eric Holder in contempt of Congress. 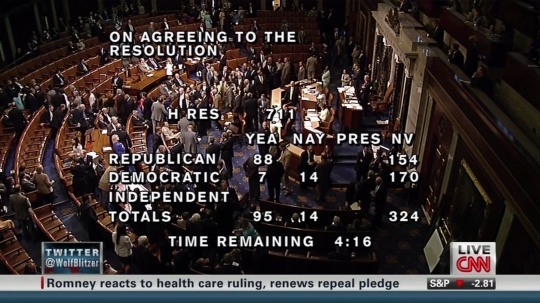 A large number of House Democrats walked out before the vote in protest. One of the things we are attempting to do is to make sure that at least a group of members of Congress express to the nation that we are non-participants in what we believe to be a calamity. This is a terrible day for the House of Representatives. What this is about, we can’t decide for sure, but it certainly is not about Eric Holder or holding back documents. And so we did not want to participate in something that we believe has some kind of smell to it. In recent months, the Justice Department has made unprecedented accommodations to respond to information requests by Chairman Issa about misguided law enforcement tactics that began in the previous administration and allowed illegal guns to be taken into Mexico. Department professionals have spent countless hours compiling and providing thousands of documents — nearly 8,000 — to Chairman Issa and his committee. My staff has had numerous meetings with congressional staff to try and accommodate these requests and yesterday, I met with Chairman Issa to offer additional internal Department documents and information that would satisfy what he identified as the Committee’s single outstanding question. Unfortunately, Chairman Issa has rejected all of these efforts to reach a reasonable accommodation. Instead, he has chosen to use his authority to take an extraordinary, unprecedented and entirely unnecessary action, intended to provoke an avoidable conflict between Congress and the Executive Branch. This divisive action does not help us fix the problems that led to this operation or previous ones and it does nothing to make any of our law enforcement agents safer. It’s an election-year tactic intended to distract attention — and, as a result — has deflected critical resources from fulfilling what remains my top priority at the Department of Justice: Protecting the American people. I have spent most of my career in law enforcement and worked closely with brave agents who put their lives on the line every day. I know the sacrifices they make, so as soon as allegations of gunwalking came to my attention – and well before Chairman Issa expressed any interest in this issue — I ordered the practice stopped. I made necessary personnel changes in the Department’s leadership and instituted policy changes to ensure better oversight of significant investigations. And, I directed the Department’s Inspector General to open a comprehensive investigation. That investigation is ongoing, and the American people and Congress can count on it to produce a tough, independent review of the facts. The problem of gunwalking was a field-driven tactic that dated back to the George W. Bush Administration, and it was this Administration’s Attorney General who ended it. Attorney General Holder has said repeatedly that fighting criminal activity along the Southwest Border – including the illegal trafficking of guns to Mexico has been is a top priority of the Department. Eric Holder has been an excellent Attorney General and just yesterday the Chairman of the House Oversight Committee acknowledged that he had no evidence – or even the suspicion – that the Attorney General knew of the misguided tactics used in this operation.